You’re probably thinking how can we help with this mood disorder at The Beauty Clinic? The answer lies within LIGHT, yes light therapy. This popular treatment is used in facial therapy for its many benefits. Using UV-free light to reduce inflammation, improve healing and the skin’s regenerative processes. Boosting collagen production and hydration levels, which gives the skin a youthful glow. It is often combined with our professional facial treatments to minimise visible fine lines and wrinkles. So, with all these skin benefits what will the light actually do for your mood? The human body responds to light, just think about how good you feel on a warm sunny day. Our bodies Circadian Rhythms help to regulate and control; food digestion and appetite, energy levels, sleep quality and mood. These rhythms regulate many important bodily functions and if you don’t receive the correct daylight signals at the correct time, this is where we start to see changes with one’s mood. You can see how this rhythm is important and without significant light we alter this natural rhythm. Light therapy has huge healing powers, the treatment of skin cancers, jaundice and SAD disorder are but a few examples. Studies have shown Light Therapy to be an effective mood booster. Increasing our serotonin levels making you feel more alert, less sleepy and alleviating or curing the “Winter Blues” – while helping your skin to look great at the same time! It’s a win win! Even better news! Light therapy is a painless, relaxing, non-invasive treatment that by using an array of bright light-emitting diodes that send low-level light energy into the deeper layers of the skin. This treatment is 30 minutes and involves a double cleanse then, 15-20mins under the light followed by your aftercare moisturizer and SPF. 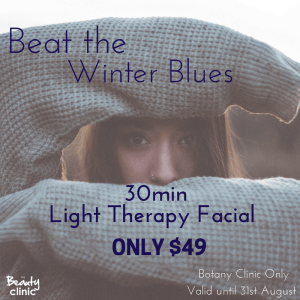 We recommend a series of Light Therapy facials, between 4-6 treatments, they can be had as little as a week apart, but as this is a safe non-invasive treatment you can have as many as you need to keep those “Winter Blues” at bay! 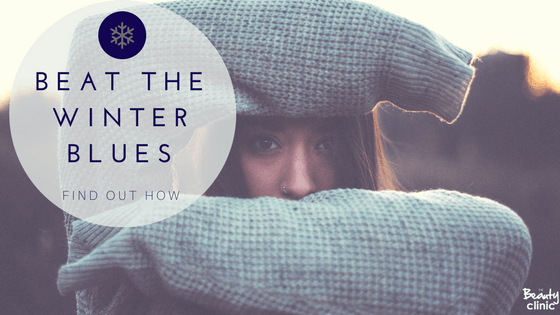 Other prescribed treatments for the “Winter Blues” include massage, better yet hot stone massage, winter woollies, hot chocolates, endless movies and warm fires. (P.S these are our personal opinion’s, with no scientific backing).